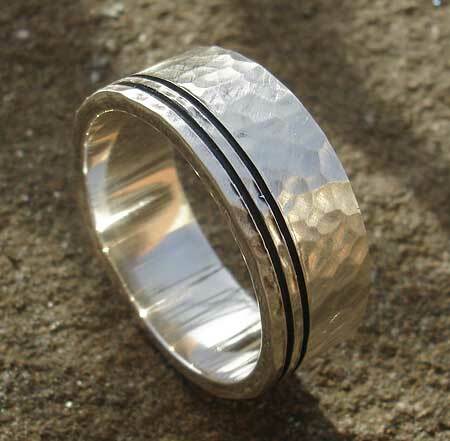 Hammered Silver Wedding Ring For Men : LOVE2HAVE in the UK! 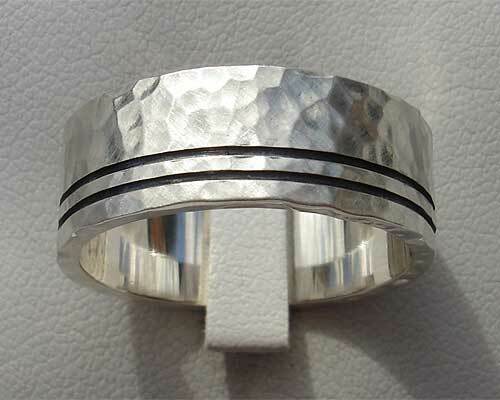 A hammered silver wedding ring for men. Silver wedding rings for men are our speciality with a vast choice of contemporary designs and finishes available including this chunky ring with black etching. This silver ring features a hand hammered finish. It comes in a finish that sits somewhere in between matt and polished. A fact you may not know when considering buying silver is that over time an in-between finish always results with continued wear. Polished loses its shine and matt shine's up a little. This ring features that very in-between style. There are twin etched grooves sitting towards one edge of the ring finished in black. The ring measures 8mm wide which makes a suitable width for a men's wedding ring.